Unparalleled charm in the heart of East London. The Dickens Inn is an original warehouse building near Tower Bridge, Tower of London and the Shard. As an original warehouse building, it’s thought to have housed tea or to have been owned by a local brewery. It certainly existed at the turn of the 18th century and may well have been born in the 1700’s. 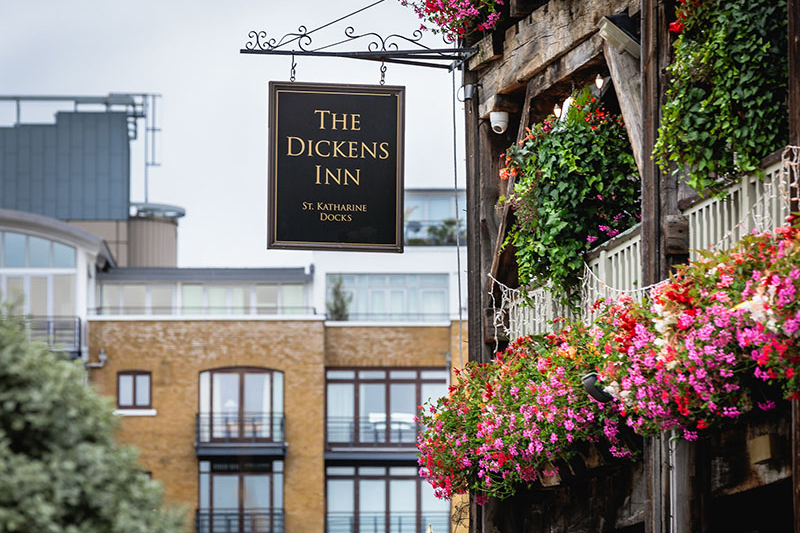 The Dickens Inn is a picturesque restyled and reconstructed 18th century pub and event venue nestled in St Katherine Docks. It boasts three floors of flexible hire spaces, with an experienced events team and range of bespoke food, drink and entertainment packages tailored to your occasion. This historic venue is fully licensed for ceremonies, plus offers a private bar, dining room, dance floor space and music license until midnight. 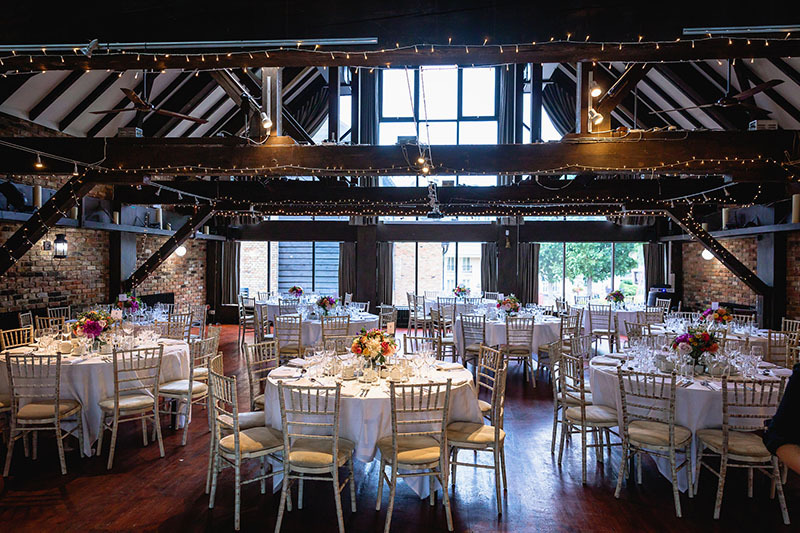 With ample outside space on the terrace and flower-bedecked balcony, and unrivalled views over the dock towards Tower Bridge and the Shard, The Dickens Inn ensures a stunning setting for the most memorable of occasions. Thank you so much for planning and executing the most amazing wedding day we could have wished for. We would love to go back and do it all over again - it truly was the best day ever. Agata and her team were fantastic and every detail was better than we imagined. 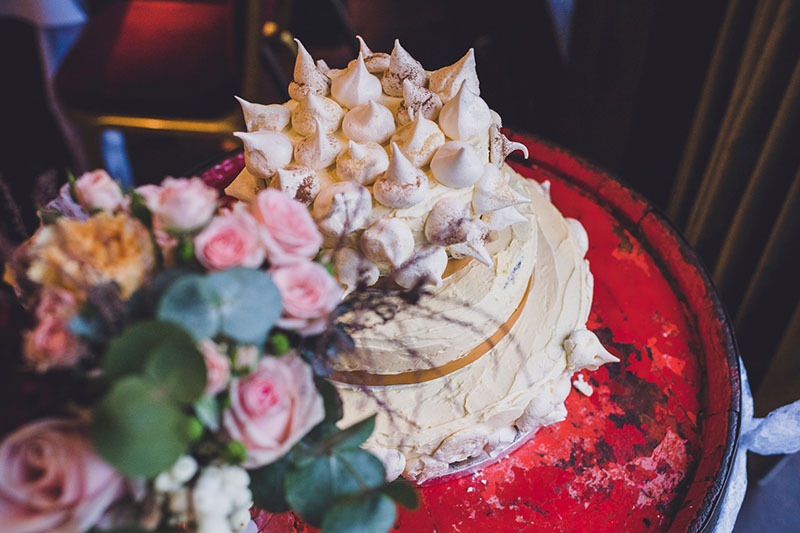 The Dickens Inn will always mean a lot to us as it was where we first met and the perfect place to say 'I Do'. Thank you so much for everything you did in the run up and on the day itself, we will be forever grateful for creating such a wonderful experience. 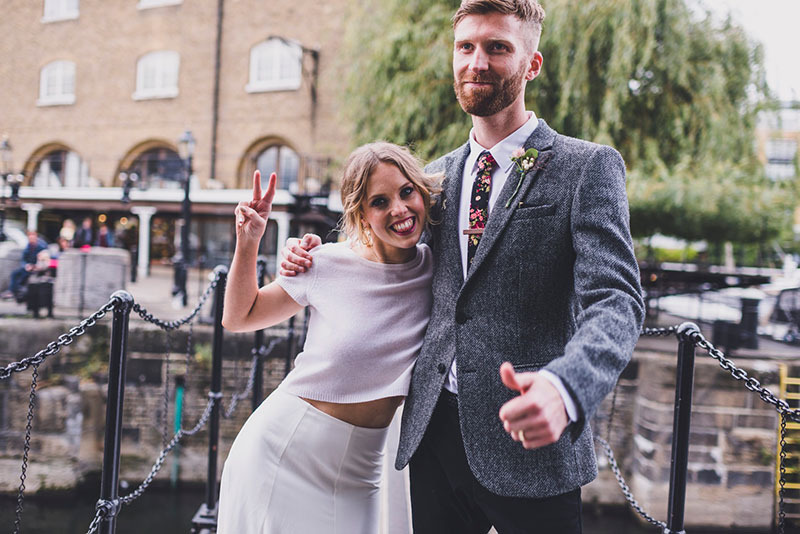 We had a fantastic day at the Dickens for our wedding breakfast and evening reception, having got married in Bermondsey earlier in the afternoon (our guests loved walking over Tower Bridge to get to the Dickens Inn!). The setting is beautiful and the room looked wonderful. We were really pleased with how the whole day went. There were no hiccups and actually the whole process right from first contact was fairly seamless thanks to Agata and the team. The food was delicious and great value, as you would expect from a brilliant restaurant. Everybody loved the whole day and we would highly recommend The Dickens. We had a wonderful wedding at The Dickens Inn. 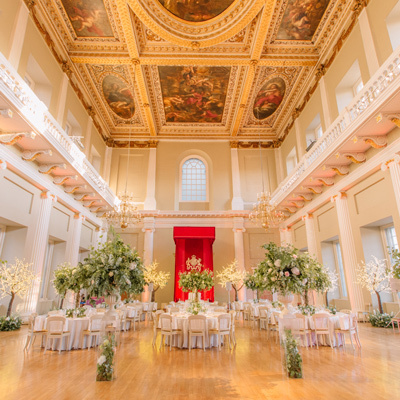 The setting is absolutely perfect and many of our guests commented on what a great venue it was. It was great to be able to have the marriage ceremony and the reception all in one place, with enough space for a Ceilidh band and dancing! The amazing location by Tower Bridge was a bonus and we got some brilliant photos there. 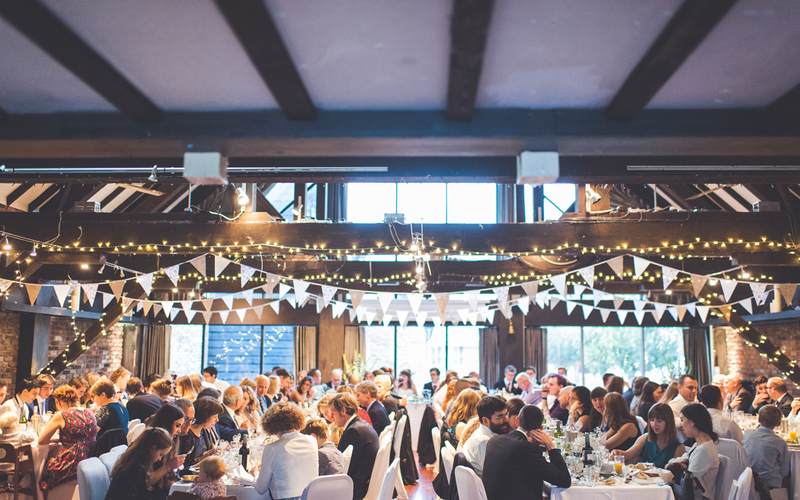 The Dickens Inn were very helpful and flexible, allowing us to set up the day before the wedding, since the room wasn’t in use. 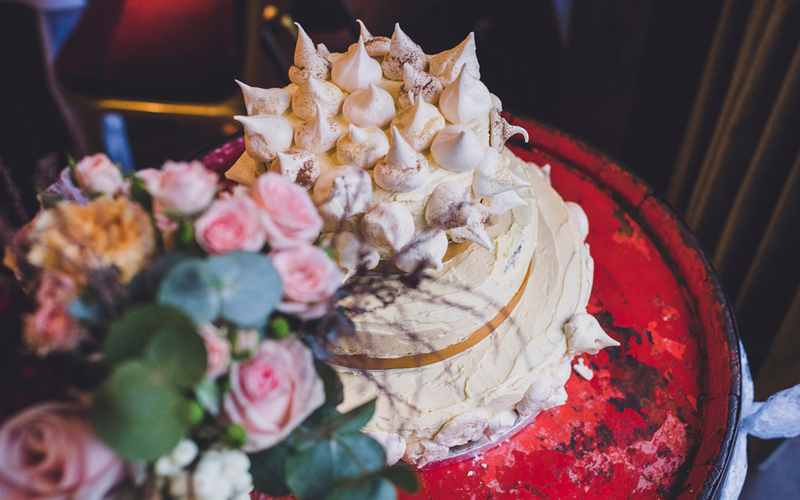 We had our wedding reception at The Dickens Inn and we absolutely loved it. It's been the best choice we made as we were torn between two venues. The Dickens Inn is an amazing place located in the most incredible area. 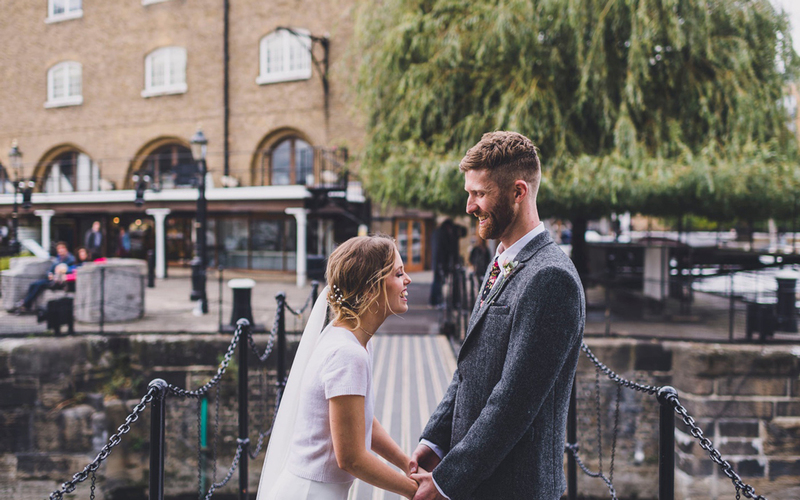 St Katharine's Dock is beautiful and the surroundings were perfect for to take some lovely photos. The room that we hired was very rustic and spacious, overlooking The Tower Bridge. It looked very pretty even before we decorated it. The fairy lights in there were very nice but we brought more and turned the place into a fairy-tale-like setting. The food was delicious and the serving was impeccable. After the meal the room was cleared up and turned into a dance floor. We opted for a ceilidh and it was super fun. All staff were very welcoming and so nice and helpful to us. From the booking process until the last arrangements after the wedding everything went very smoothly. It just couldn't have been less stress free. We are so so pleased we found The Dickens Inn and we would go back there anytime as it's one of the best places in London.